Add A One Claypot House to your favourites! Deep Fried Seabass only $18.80! A One Claypot House Restaurant offers you traditional and whole food with natural flavours from the ingredients, without preservatives. For the health conscious, claypot cooking uses less oil while retaining its natural flavours. There are 10 A One Claypot House outlets in Singapore located islandwide. Visit an outlet today try signature dishes such as the A one Superior Pot and Hotplate Sesame Oil Chicken Noodle. 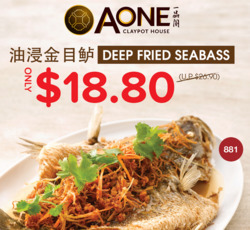 Visit the website to check out the A One Claypot House menu and to find out about the latest A One Claypot House promotions. A One Claypot House also offers the traditional claypot bak kut teh. A One Claypot House was established in Singapore since 2008. Do you want to receive more offers from A One Claypot House by email?